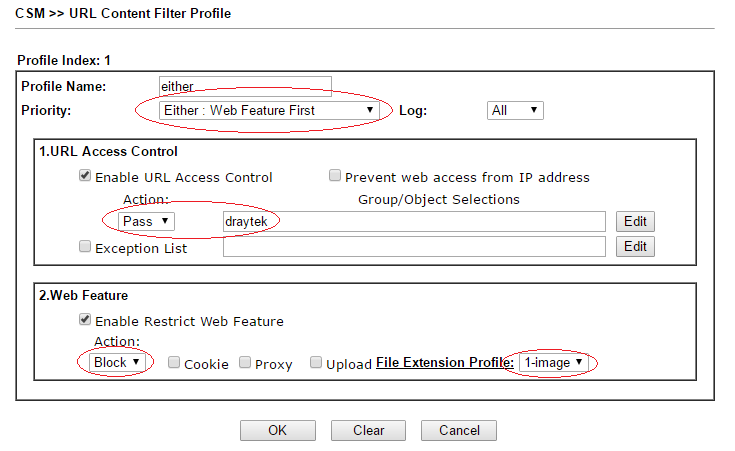 The difference between the Priority in URL Content Filter profiles - DrayTek Corp. In a URL Content Filter, there are four options for the priority setting: “Both: Pass”, “Both: Block”, “Either: URL Access Control First”, and “Either: Web Feature First”. In this note, we're going to explain the differences between them. If both “URL Access Control” and “Restrict Web Feature” are enabled, only the HTTP request that contains both the specific keyword and web feature will be passed. For example, we may create a URL Filter to pass only the HTTP request that contains keyword “draytek” and file extension “.png”. 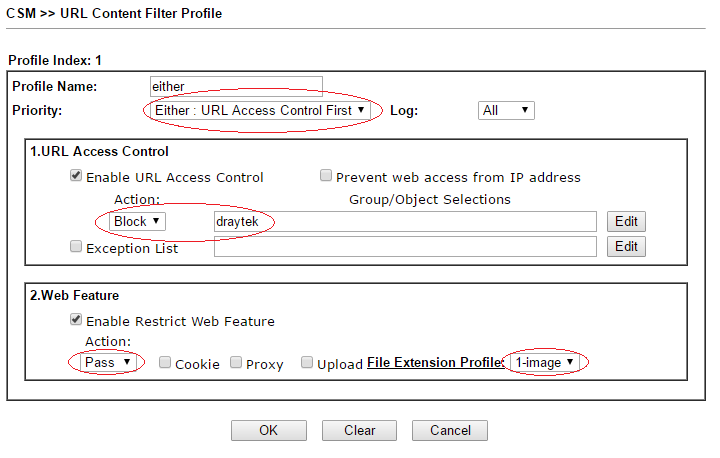 If the above URL Filter is applied to a Firewall Rule, all the access to “www.draytek.com” and other websites will be denied. 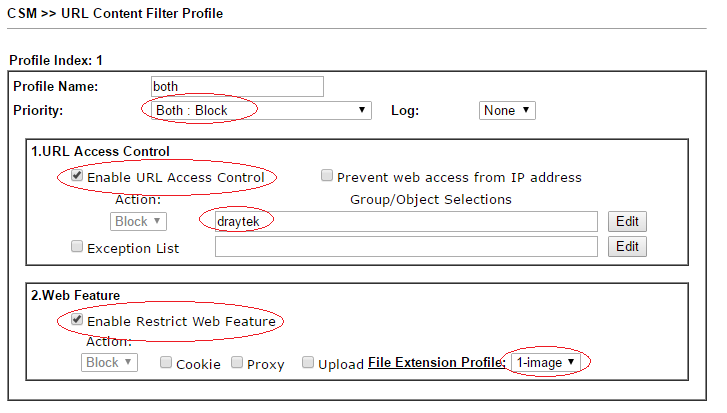 With the above configuration, LAN clients can access “www.draytek.com”, but they will find that the images on www.draytek.com are blocked. However, they will have full access to other websites. If both “URL Access Control” and “Restrict Web Feature” are enabled, the router will check both URL Access Control and Web Feature Restriction. But URL Access Control has a higher priority. For example, suppose there is a URL Filter is set to block the HTTP request that contains “draytek” in its URL but pass those have file extension “.jpg”. 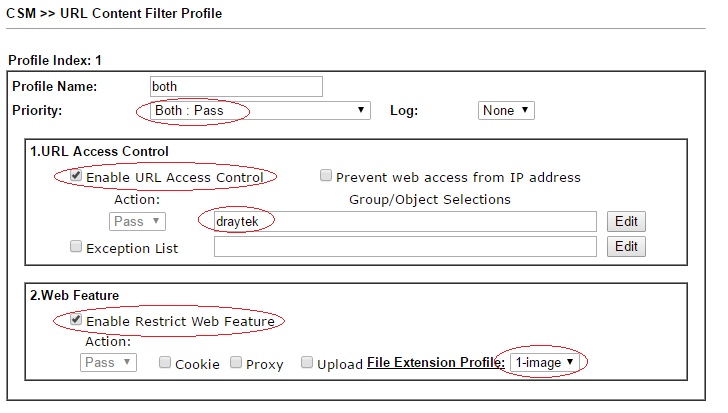 If the URL Filter is applied to a Firewall Rule, LAN clients' access to “www.draytek.com” and will be denied. If both “URL Access Control” and “Restrict Web Feature” are enabled, the router will do both URL Access Control and Web Feature Restriction. But Web Feature Restriction has a higher priority. For example, suppose a URL Filter is set to pass the HTTP request that contains “draytek” in its URL but block those have file extension “.jpg”. If the URL Filter is applied to a Firewall Rule, all the images will be blocked, even if its URL contains the keyword “draytek”. 1The difference between the Priority in URL Content Filter profiles has been viewed------ 1 ------times.